Today as I was admiring the fresh new growth on my Japanese Maple and saw something disturbing. The buds were just breaking open with our warming April weather, unfurling delicious colors that were vibrant with life. 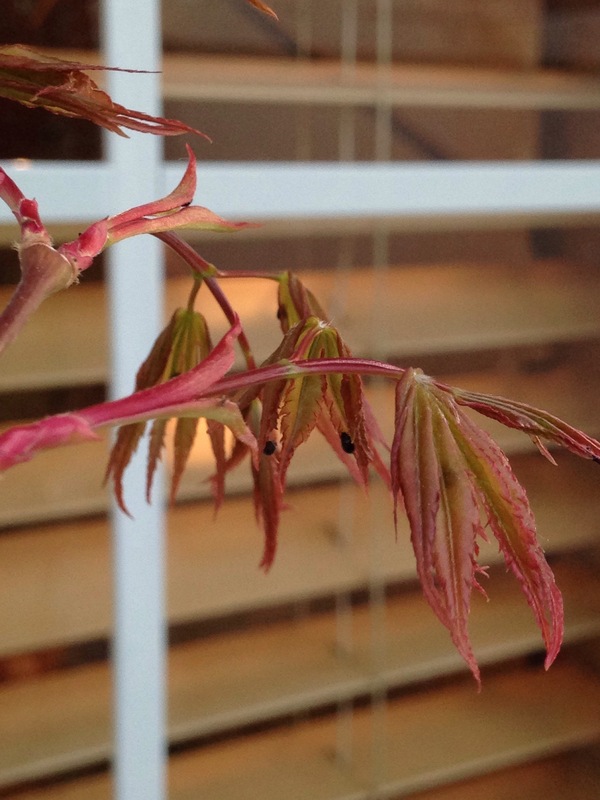 It must have been a signal to the Japanese Maple-eating pests, the dinner bell was ringing! There were little black dots all over these new leaves. Black spots on the tips of the branches. Upon closer inspection I noticed that they were soft and easily scraped off. Unfortunately the leaves were so tender that it was hard not to damage them as well as I tried to remove the little black bugs. As I looked closer at the photo and did a little research, it seems that they may by some type of black aphid. Could it really be aphid season already? I’m not prepared for this! I have been winter lazy, thinking everything was hibernating still. But spring is here! Even though I’m still wearing sweaters and dashing through rain showers, the pests are right on schedule. Tomorrow I’ll try and pull off more of these little black bugs and watch them for a while. The tree is small enough that I can easily take care of them without sprays. What do you think? Have the aphids arrived? Oh no – they rather do look like aphids, don’t they? At least you’ve spotted them now, you can take care of them before they get out of hand.